Hi there dear friends!!! 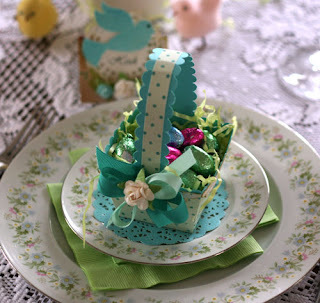 I'm very excited to show you my place setting ideas that I will be using this year to jazz up our Easter Celebration! 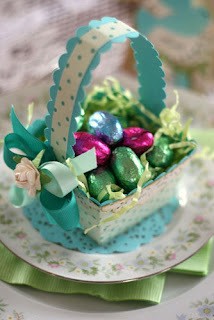 Glitz Designs patterned papers inspired me to make everyone a mini basket full of candy and a cute little place card that will add some color and make each spot at our table special! The basket is sitting on a little doily cut from Glitz Design Hoopla Frames patterned paper using Papertrey Ink's Parisian Doily Die. The basket is made using Glitz Design Hoopla Dots paper and Papertrey Ink Hawaiian Shores Cardstock. 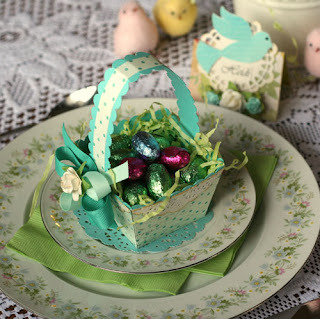 I also used a vintage cream doily to decorate the edges of the basket. I embellished the basket using Papertrey Ink Aqua Mist Twill ribbon, Hawaiian Shores Grosgrain ribbon and a Prima Fairytale Rose. I made the place card with a folded piece of Glitz Design Love Nest Floral Paper. I stamped the Glitz Design Maya Bird onto Papertrey Ink Aqua Mist paper using Colorbox turqoise ink and I added a little jewel from Kaiser Craft. 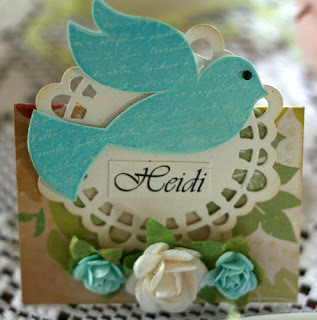 I mounted the bird onto another doily I die cut using Papertrey Ink's Doily Details collection. I added the name and embellished with Prima and Recollections flowers. 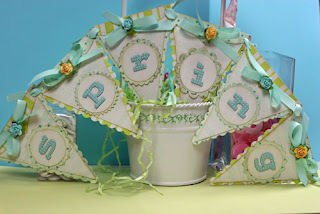 I also made a Spring Banner for our celebration using Glitz Design Hoopla Dots Paper and Glitz Design Love Nest Stripe paper. 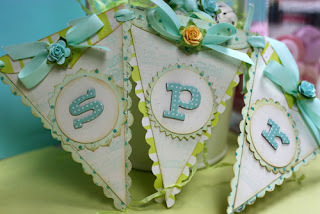 I hand cut the banners and added a scalloped border. I die cut the Banner Borders that grace the top of each banner with Papertrey Ink's Banner Border die. I added Papertrey Ink's Aqua Mist Twill Ribbon and Recollection's Roses. I die cut the circles with Papertrey Ink's Limitless Layer's Collection. I used American Crafts Flat Thickers to spell out spring. Papertrey Ink cardstock, ribbon, dies; Prima and Recollections florals; American Crafts Thickers. These Glitz design papers are my favorite and I am so excited that I was able to use them for my Easter celebration! I hope I have inspired you to make some goodies for your Easter celebrations and I hope you grab yourself some of these amazing Glitz Design Papers. They are so versatile and perfect for any project you have planned!! Thanks for stopping by and I wish you a very Glitzy Day! !